The set is white paper mache. A few books sit center stage. Brianna Grey Rodriguez, dressed in white overalls, picks up one of the books and opens it. 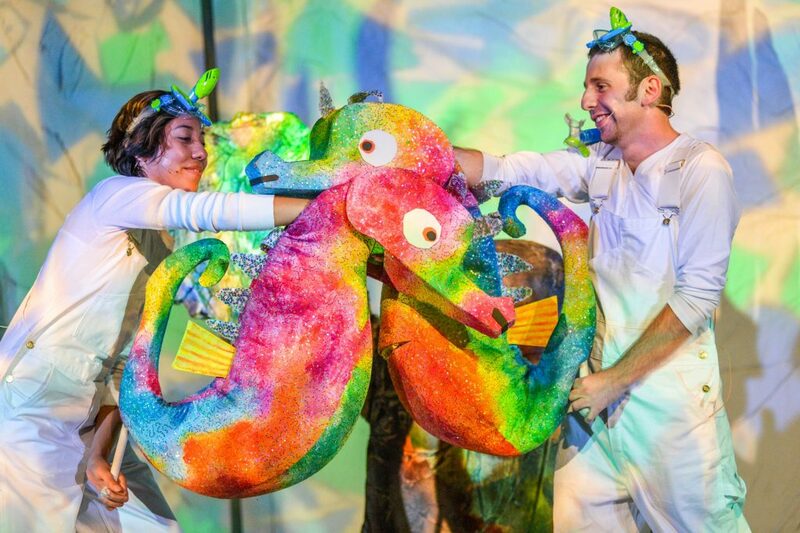 And then we enter the magical and colorful world of Eric Carle—brought to life by four energetic and compelling young actors, directed by Simon Trumble at the Bay Area Children’s Theatre in Berkeley. 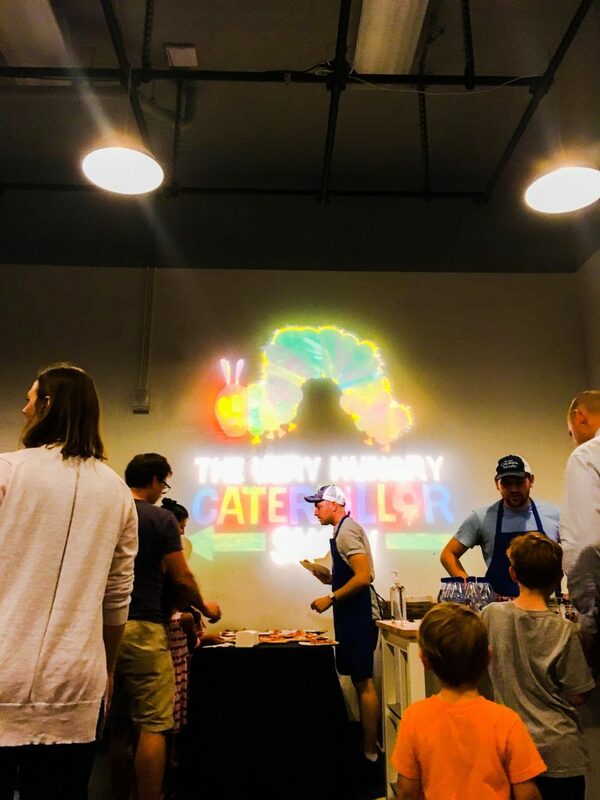 Pizza and pre-ordering ice cream for intermission before “The Very Hungry Caterpillar Show” in the large, kid-friendly lobby. “Yeah, me too,” I said. 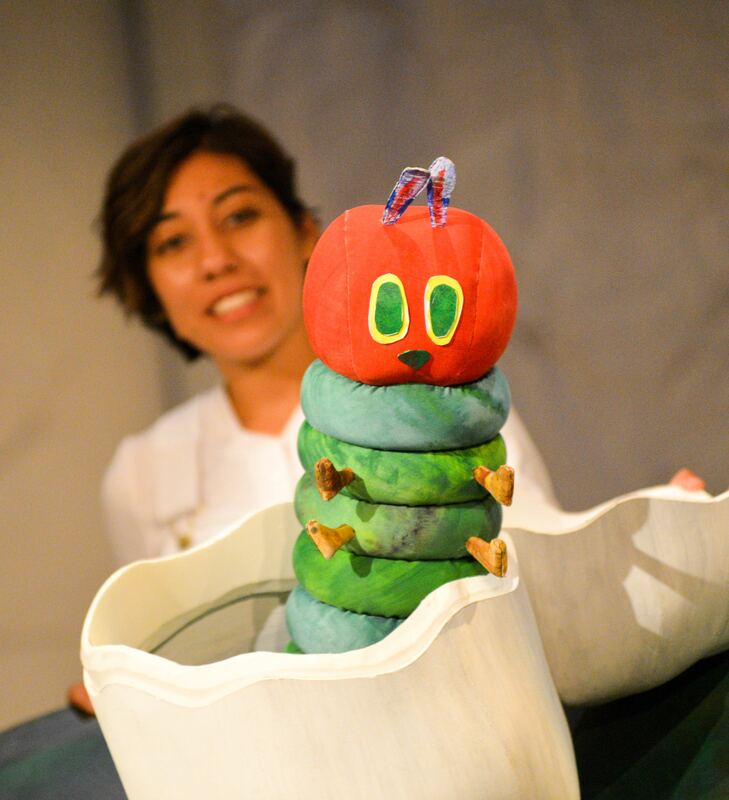 In fact, the anticipation is so great that Nina Meehan, Executive Artistic Director, has to remind the audience that what they are about to see consists of four stories and that–worry not–there will be a caterpillar spotting tonight. It’s the last of the four, the most well-known, and—at least in this context—a surprising underdog to the three others. That’s due to the fact that this turns out to be puppet theater—and a surprisingly inventive, creative, and moving one at that. Many of the 75 puppets in the show—think an orange, nearly-life-size cow, for example—are both beautifully crafted and excellently wielded by the actors, who manage to convey character and emotion through each one. Almost every puppet gets a little gasp from the audience when it appears, especially in the first story, “The Artist Who Painted a Blue Horse.” A smiling and bouncy Kevin Rubultan plays the artist, magically transforming blank white canvases into paintings of brightly colored animals just as the live puppets appear on the stage. The three other actors all mimic the action and emotion with their facial expressions–amplifying the effectiveness of the puppetry. 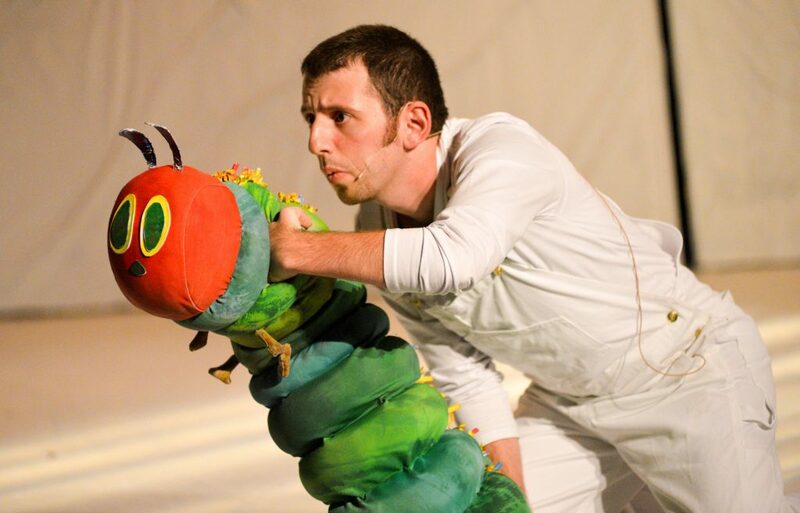 When the caterpillar finally makes his appearance, well, the kids clap, shout, and participate. But it’s the final moment of the show, the revelation of the butterfly, that’s the real stunner and the last puppet of them all. I’ll admit it. In a lot of children’s shows my mind wanders, and I often marvel at the silliness unfolding in front me, wonder if paying people to entertain your kids day after day is kind of exploitative, and reflect on how different my life is now that I’m father. But in this show, due to the inventiveness of the puppetry and the familiarity of the stories, I was in it with the kids. Mostly. There was a point when I was thinking about how having kids is kind of like reliving childhood over again–just when you thought you were done with musicals, watching your language, team sports, and play-structure accidents it all comes surging back again. But hey, in this show that’s the fun of it. 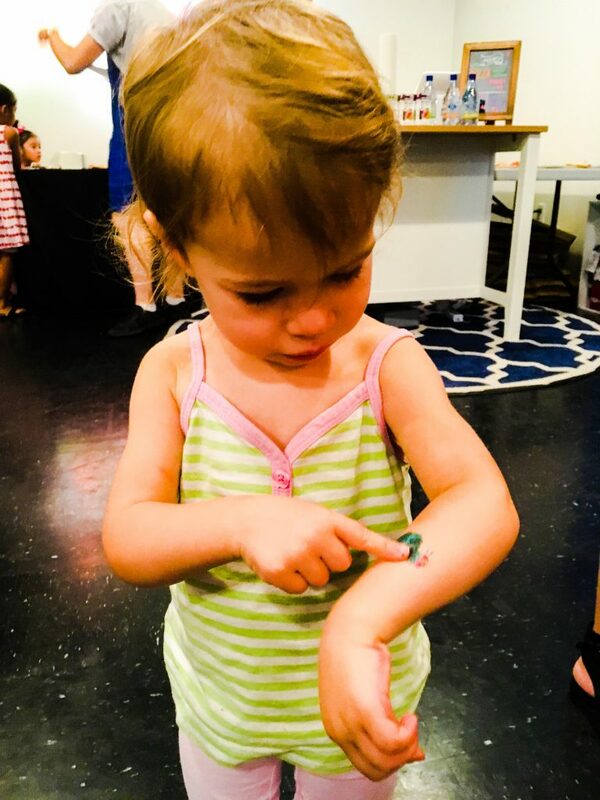 I stuck my pinky through the holes in the pages of the The Very Hungry Caterpillar over thirty years ago on cold winter nights in Minnesota, and now my daughter, Itasca, is getting a caterpillar tattoo on her arm in Berkeley, California. Eric Carle’s story is about transformation after all–about that drastic metamorphosis from worm to wing. I guess that means that my twenties were just a cocoon? Cast: Kaleena Newman, Pablo Max Hamlin, Brianna Grey Rodriguez, and Kevin Rebultan.